Opposition to vaccination has a lengthy history dating back to shortly after the discoveries by Jenner in relation to smallpox. In recent years though governments have sought to counter the concerns of anti-vaccinationists in a variety of ways, including legislatively in Australia, in an effort to protect against childhood diseases and to maintain herd immunity. However, cases continue to make their way through the courts where parents oppose the vaccination of their children, often inspired by the views of both registered and unregistered health practitioners, including homeopaths and chiropractors. This article catalogues recent decisions by the courts in Australia, New Zealand, the United Kingdom and Canada, most of which are in favour of vaccination and have dismissed the arguments of those opposed to vaccination as unscientific. It argues that Australia should give serious consideration to emulating the model existing in multiple countries, including the United States, and should create a no-fault vaccination injury compensation scheme. The World Health Organization and several United Nations bodies and personnel have called for a human rights perspective to be integrated into mental health and community services. While there are ongoing debates about what this means for law reform and practice, the World Health Organization “QualityRights” program provides a starting point for educational training in human rights that may be of benefit for mental health practitioners. This column explores some of the challenges for integrating a human rights perspective into mental health treatment and care and outlines the QualityRights program. Data from both medical and legal investigation can provide significant opportunities for legal and regulatory policy development that in some sectors are often ignored or missed. The provision of safe and high-quality care for the vulnerable, frail older people who live in residential aged care services (often termed nursing homes) in Australia continues to come under enormous scrutiny. The year 2017 saw a plethora of inquiries, some concluded and others ongoing, investigating the safety and care provided to residents. These inquiries have ramifications for the collection and use of data in the development of policy and regulation aimed at improving care within the aged care sector. A recent Senate Inquiry investigated the Prostheses List (PL) which has been an integral part of the private health care system since its introduction in 1985. The PL sets the price of various prostheses products available for private health insurance patients. In recent years however, the PL has come under scrutiny due to the inflated prices of prostheses, lack of transparency from the list’s creators and regulators, and increased premiums. This column critically analyses the recent Senate report, particularly as to whether it appropriately addressed the various concerns and issues raised in submissions and terms of reference of the inquiry and what ongoing role the PL should have in the Australian Healthcare System. Doctors Francis Timothy Hartnett, Zygmunt Epstein and Izso Hartmayer Van der Hope were the first medical practitioners to appeal against decisions of the Medical Board of Victoria (Board) to cancel doctors’ registration to practise medicine after finding that they had engaged in “infamous conduct in a professional respect”. This article analyses the Board’s decisions in the 1940s regarding these three doctors and their appeals. The article argues that the doctors were unconventional and the Board’s members, whose own career successes were built on their adherence to custom, allowed their aversion to the doctors’ nonconformity to compromise their impartial assessment of their behaviour. The Board had only the finding of infamous conduct and the sanction of deregistration with which to respond to doctors’ conduct that fell below professional standards, but in these three cases, cancellation of the doctors’ registration to practise medicine was unduly severe and disproportionate to the gravity of their behaviour. This investigation illustrates the importance of the passage of legislation – after these cases were heard – empowering the Board to impose more lenient sanctions than deregistration for doctors’ unprofessional conduct. It also highlights that regulators of the medical profession must still ensure that any antipathy they may feel towards doctors for their unconventionality does not influence their assessment of a fitting response to their conduct. This study is part of a larger, Australian Research Council–funded project studying comparative analyses of complaints and notification handling between the NSW system and National Registration and Accreditation Scheme (2010). This article explores the assessments and decisions made by Tribunal and other quasi-judicial decision-makers involved in the two schemes, including the key decision-management stages during a disciplinary process. Respondents recruited from both systems completed an online questionnaire comprising a series of closed and open-ended questions to case vignettes. While we found no significant difference between jurisdictions in relation to their decision-making processes in this case, the article provides insights into the rationales for their decisions and the outcomes or “sanctions” selected by decision-makers as being appropriate to the circumstances presented. For generations, dental students have been introduced to, and practised, clinical skills through the use of their fellow classmates as surrogate patients. These skills include verbal and communication skills such as the taking of medical and social histories, and practical skills such as the administration of local anaesthetic by injection. Largely such practices within dental education have been accepted through convention. This article aims to consider the use of students in dental education as surrogate patients and questions whether such practices may create issues relating to consent, coercion and confidentiality. Also examined within this article is whether practical surrogacy may lead to the introduction and development of unprofessional behaviours. This article investigates whether a sample of Indian women involved in commercial surrogacy arrangements were exploited by their intended parents. This issue is topical as the Indian parliament is currently considering a ban on commercial surrogacy. This is due to a range of concerns, including that such arrangements are unethical and exploitative of illiterate women from low socio-economic backgrounds. We define the term “exploitation” and identify from the literature the three key elements that we argue provide a conceptual framework through which to analyse whether exploitation has occurred. We conclude that there are indications that many of the women were exploited. However, we contend that the practice should not be banned as this would mean that the commercial surrogacy industry in India would no longer be regulated and women who become surrogate mothers may be exposed to greater risk. Since the eradication of smallpox was declared in 1980, debate has ensued over what to do with the remaining stocks of the causative agent, variola virus. For more than three decades the World Health Organization has resolved to destroy the virus isolates, now maintained in high-security laboratories in the Russian Federation and the United States, and each time the deadline has been deferred. The legal facets of this debate have been largely overlooked. As genetic resources, all viruses fall within the scope of the United Nations’ Convention on Biological Diversity (CBD) that provides for “the fair and equitable sharing of the benefits arising out of the utilisation of genetic resources”. This article examines the possible ownership scenarios for variola viruses and concludes that the conservation principles of the CBD and the ambiguous sovereign status of individual isolates may preclude the destruction of the world’s remaining variola stocks. This article explores a systems-theoretical question on the “resonance capacity” of medicine and law that has enabled a recent obstetric change. Insights from autopoietic theory guide my analysis of these subsystems’ preconditions or self-referencing processes supporting obstetrics to take up pregnant women’s requests for caesarean sections for social reasons. Previously, obstetricians performed caesarean sections on medical grounds only. That change became possible: it resonated with obstetrics, despite limitations imposed on obstetrics and law by these subsystems’ unique codes and programs, and in light of law’s self-determining individual. This article argues that although the change represents a victory for women’s human rights in challenging paternalistic medical decision-making, paradoxically it extended medical control over childbirth by further displacing midwifery. However, obstetricians, midwives and pregnant women have been less empowered by the change. The article interprets how structural limitations or preconditions affect the capacity of communications to resonate and contribute to society’s evolution. There is an immediate need to reform Australian State and Territory strata laws to minimise exposure to second-hand smoke (SHS) in multiunit housing (MUH), particularly in light of the trend towards higher density living. SHS is a cause of lung cancer and other health problems in nonsmokers and no safe level of exposure has been established. Despite being a common cause of dispute in MUH, currently no strata regime in any State or Territory includes a model by-law that specifically addresses smoking, as is the case with other contentious issues like pets. Smoking disputes can currently be dealt with under general strata provisions on nuisances or hazards, but the case law in this area demonstrates that these provisions can be ineffective in dealing with the serious health issue posed by SHS. With enough votes, owners’ corporations can introduce a smoking by-law. However, without legal advice it may be difficult for owners’ corporations to develop a by-law they can be confident falls within their by-law making powers. With several jurisdictions currently reviewing their strata laws, there is a valuable opportunity to sensibly reform the law in the interests of public health. In this article, we survey the legal landscape and consider options for a model by-law on smoking. This article uses the public record to demonstrate the inadequacy of the current liquor licensing decision-making system in New South Wales (NSW) with regard to reducing alcohol-related harm. It describes and compares planning and liquor licensing decision-making systems and examines all decisions regarding applications for new liquor licences published by the NSW Independent Liquor and Gaming Authority in 2016. These decisions are reviewed with regard to the Authority’s duty to consider social impacts. The review identifies processes and patterns of decision-making that favour the applicant, demonstrate inconsistencies, fail to use health statistics, misinterpret other statistics, make inconsistent use of reputable health research findings and treat legal obligations as mitigations. The cumulative effect is a low refusal rate. Of 168 applications, 15 were refused. Review and appeal for objectors have been severely restricted in NSW. Recommendations are an increasingly important aspect of the coronial jurisdiction. This article offers one of the first critical analyses of the impact of coronial recommendations in Tasmania. In doing so, it provides a fresh perspective on coronial law from a jurisdiction that is sometimes overlooked. The article presents research (based on documentary evidence and interviews with key stakeholders) on the implementation of recommendations made by Tasmanian Chief Coroner McTaggart. The recommendations concerned unexpected infant death and youth suicide. They prompted significant reform in both areas. In view of this evidence of the power of coronial recommendations, the article argues that Tasmania should consider adopting a mandatory response framework. Information regarding childbirth is currently inadequate to allow truly informed decisions regarding mode of delivery. The concept of patient autonomy is complex. How doctors transmit information to allow for patient self-determination should be seen within the different models of patient-doctor relationship. There are a number of specific dilemmas for obstetricians in providing balanced information to women. The profession needs to establish some specific standards of information for women preparing for childbirth. Legal decisions in childbirth-related medical litigation have focused on the concept of self-determination but are doctors enabling true informed consent when only information regarding the medical interventions is given and not information regarding the entire process of childbirth? The announcement of a serious illness, like cancer, can be very stressful for adolescents and young adults, as well as for their parents. In view of this difficulty, the protection of patients’ dignity and autonomy is a central concern of medical ethics. It was with this goal in mind that a French “Announcement protocol” was developed following the First French Convention for Cancer Patients (1998) and reaffirmed, in 2010, by the First French Convention for Child Cancer Patients and Their Families. Because the ethics literature on this subject is underdeveloped, an empirical study was conducted from 2012 to 2016 to explore patients’ and parents’ experience. This study concerns adolescents, young adults, their parents and their health care professionals. The objective of this article is to present the outcomes of the study, summarising the experience of patients, parents and professionals and outlining current practices in France. This article analyses how the Advance Care Directives Act 2013 (SA) is changing the decision-making paradigm in health care and guardianship in South Australia. It examines the background to the legislation, the main areas that have been transformed by the Act and the amendments to associated legislation. The significant changes include an increased respect for autonomy and a presumption of decision-making capacity, a new paradigm of substitute decision-making, clarification of the decision-making hierarchy, and protections for medical practitioners who decline to give treatment that would have no benefit to a dying patient. Despite some difficulties implementing the new scheme, this article argues that the Act has introduced important changes and clarifications in the law that other States would do well to follow. When it is fully implemented, the Act will ensure that the wishes of patients are respected and that doctors can follow these wishes without fear of prosecution. 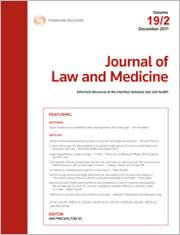 An empirical critique of Australia’s medical indemnity “crisis” challenges assumptions about the role of the courts through determination of civil liability for medical negligence, occupational discipline and criminal liability. Courts were identified as a cause of a “crisis” in the 2000s that triggered extensive legislative reform of medical negligence law, absent adequate empirical data substantiating either criticisms of the courts or supporting the reforms. Changes to the occupational discipline framework for health practitioners were less controversial but have resulted in increasingly legalistic responses. Using a detailed longitudinal analysis across all jurisdictions this article examines the role of the courts in responding to patient harm across the relevant 25-year period encompassing these reforms, to determine whether the courts did “cause” the medical indemnity crisis, what effect the reforms had and what other roles the courts play in responding to patient harm. The extent to which legal determinations of capacity are genuinely separate from medical opinion on capacity presented to the court as evidence, is an open and important question. In order to explore this question, an empirical study was done on the use of medical and non-medical evidence to establish capacity in three different capacity contexts: “personal/financial” capacity, testamentary capacity and legal matters capacity. The study showed that the use of medical evidence to establish capacity was by far the heaviest in personal/financial capacity matters, often to the point of effective exclusion of other forms of evidence. Concerns with the weight given to medical evidence in personal/ financial capacity matters were identified. The concerns have implications for the specific jurisdiction considered, and for the wider question of how capacity is and should be determined in a legal setting. For the PDF version of the table of contents, click here: JLM Vol 25 No 2 Contents.